Cuts through the Crowd Noise. The RemoteAmp is a simple battery-powered personal headphone amplifier. 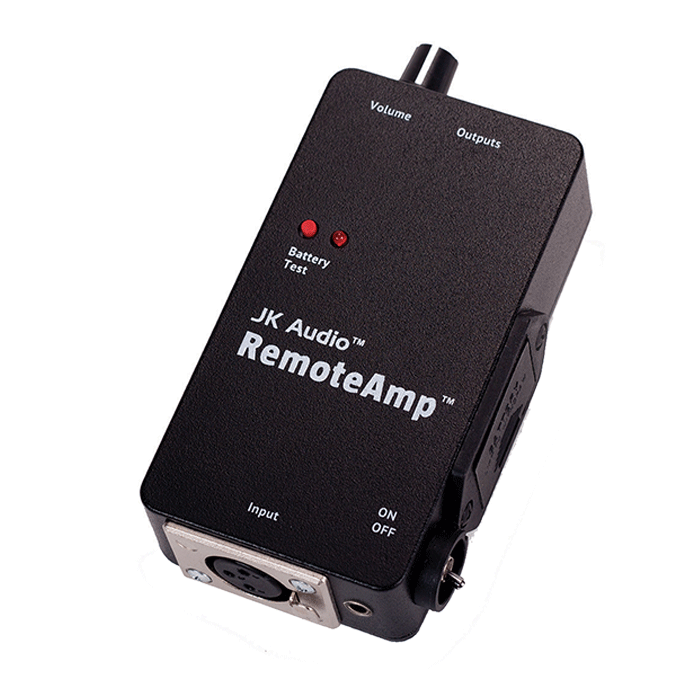 Use the RemoteAmp as an IFB earpiece or headphone amplifier, or as an on-stage monitor headphone amplifier. This low-distortion, ½ watt amplifier will cut through the crowd noise without distortion. The RemoteAmp clips to your belt and accepts a 3-pin XLR audio input from a mixer, distribution amplifier, telephone line hybrid, or a handset interface like our QuickTap IFB. You’ll like the convenience features, such as the separate power switch, which allows you to leave the volume control set at a comfortable level. New to RemoteAmp is a low impedance 3.5mm TRS Stereo Line Input, designed to mix the headphone output of any device into your program feed. This input remains in stereo all the way through to the headphone outputs.